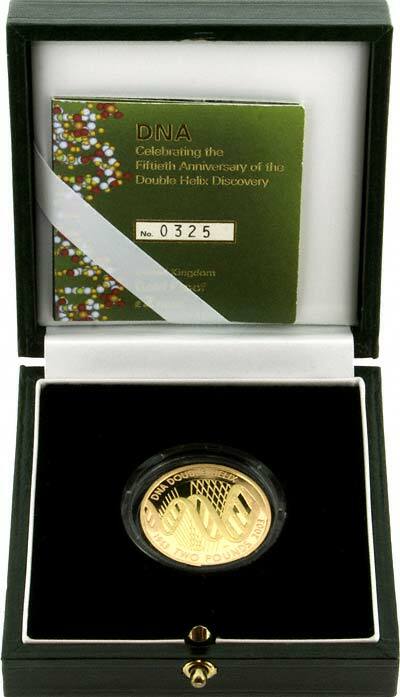 The two pound coin for 2003 commemorates the fiftieth anniversary of the discovery of the structure of DNA (Deoxyribonucleic Acid). Francis Crick and James Watson described the double helix structure of DNA. By the time Watson and Crick turned their attention to solving the chemical structure of DNA, DNA was known to have the following attributes: - DNA is made of nucleotides, chemical building blocks made of three parts: a phosphate group that is linked to a deoxyribose sugar, which is in turn linked to one of four nitrogenous bases - adenine (A), cytosine (C), guanine (G), or thymine (T). Nucleotides are linked in series into a chain, with phosphate and sugar groups alternating. Phoebus Levene had determined these chemical characteristics. - In the DNA of any given type of cell, the amount of adenine approximately equals the amount of thymine, while the amount of cytosine approximately equals the amount of guanine. Erwin Chargaff had shown this in 1949. - X-ray diffraction patterns, obtained by Rosalind Franklin and Maurice Wilkins, revealed great symmetry and consistency in the structure of DNA and gave important clues about its dimensions. Watson and Crick raced to find the structure before anyone else. They were competing with Linus Pauling, who had earlier discovered the alpha-helical structure of some protein molecules. While Watson and Crick were still working on their model, Pauling published a paper suggesting a triple-helical structure for DNA. Others quickly realized that the model was chemically flawed. Watson and Crick used paper cutouts of the bases and metal scraps from a machine shop to come up with their own model. - DNA is a double helix, with the sugar and phosphate parts of nucleotides forming the two strands of the helix, and the nucleotide bases pointing into the helix and stacking on top of each other. - The nucleotide bases use hydrogen bonds to pair specifically, with an A always opposing a T, and a C always opposing a G. - The two strands of the double helix run in opposite directions. Their 900-word paper, published in Nature, concluded, famously, "It has not escaped our notice that the specific pairing we have postulated immediately suggests a possible copying mechanism for the genetic material." Watson, Crick, and Wilkins received the Nobel Prize for Physiology or Medicine in 1962. Since 1986. the Royal Mint has issued two pound coins, both for circulation and as commemorative versions for collectors. In 2003, as the latest in this series of £2 coins, the Royal Mint is has produced a design commemorating the fiftieth anniversary of the discovery of DNA. 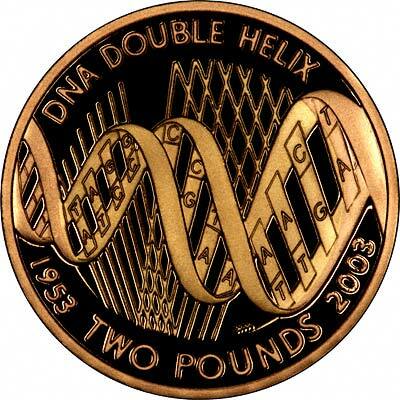 In addition to the gold proof version offered here, the DNA £2 is being produced the following different versions, further details of which are shown on our other web site. Ordinary circulation version, which should be available from banks and post offices during the year. Specimen version, issued in Royal Mint folder. This has a superior finish compared with the ordinary coins, so will be preferred by most collectors. the folders are also very attractive and informative, and made interesting and unusual gifts. Silver Proof version, with the outer part gold plated. Piedfort proof version, similar but made double weight, with a lower mintage. 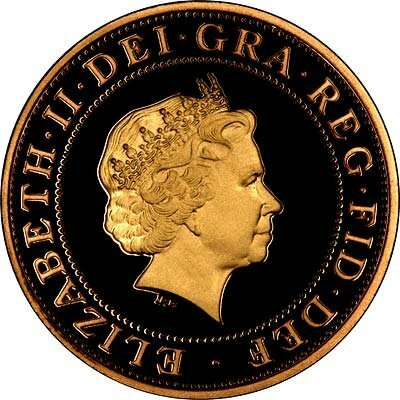 The gold proof version has been produced in 22 carat red gold, with the centre "gold sprayed" according to the Royal Mint, before striking. The issue limit is likely to be fixed at a maximum of 2,500 individual pieces, with a further 2,500 reserved for inclusion in the 3 coin but not the 4 coin gold proof sets. There is also an incuse representation of a double helix on the edge. Issue Price = Official Royal Mint issue price. Price £ = Our price in pounds sterling. Price $ = Our price in US dollars.